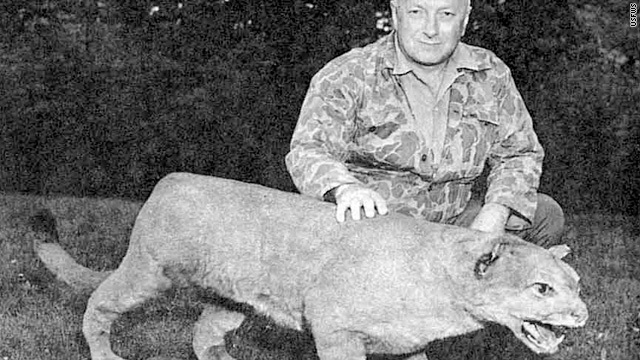 The last eastern puma, seen here with biologist Bruce Wright, was trapped and mounted in Somerset County, Maine, in 1938. The large, solitary predatory cat once lived in every Eastern U.S. state in a variety of habitats, including coastal marshes, mountains and forests, said Dr. Mark McCollough, the agency's lead scientist for the eastern cougar. But you've probably never seen an eastern cougar - the last confirmed identification was in 1938 in Maine. Other subspecies of the cougar, also known commonly as mountain lions, wildcats, panthers and pumas, still exist in the United States, including the Florida panther. Scientists have held out hope, based on scattered reports, that a few eastern cougars remained. Those sightings turned out to be other subspecies from the Western United States - where the cougar population is growing and expanding its range eastward - or captive animals that were freed or escaped. "We still have cougars and mountain lions in the United States that look identical to what we had in eastern North America, and that's probably what people are still seeing," McCollough said. "But the scientific and historical evidence point to the conclusion that the eastern cougar subspecies has not existed for a while." It typically takes the agency a long time - and a lot of field work - to officially declare an animal extinct. People often confuse cougars with white-tailed deer, bobcats, even yellow labs, said Martin Miller, the service's Northeast Region chief of endangered species. But near the sites of reported spottings, scientists have been unable to find the physical marks commonly associated with cougars in the wild, such as scratching posts and cached animal remains. "We recognize that many people have seen cougars in the wild within the historical range of the eastern cougar," Miller said. "However, we believe those cougars are not the eastern cougar subspecies. We found no information to support the existence of the eastern cougar." Western cougars are starting to become more abundant in california. I see them everyday at the gym and the local bars. Western cougars attack quite frequently but are seldom reported. I am a little late on this thread, but there was at least one alive in 1995 in the State of Maine because I saw it late one night crossing the road in front of me in Troy, Maine. Hopefully, there are more hiding out in the woods of Maine. At least one what? Unless you captured and studied the animal you have no way of knowing if it was an eastern cougar or not since they were physically identical to the western cousins. For the record, a cougar being located in the eastern United States does not make it an eastern cougar. We've seen a large predatory cat like animal on our place in Maine. Like nothing we've ever seen before. May be one of these. Had a long tail with black hair on the tip, with flat looking face. I had heard that the primary difference between the Western and Eastern Mountain Lions is just the overall size of the adult. Don't know if that's true or not. They've said for years that they no longer exist in WV, despite a lot of sightings in places like Clay and Nicholas County. Now suddenly everyone is just seeing Western Mountain Lions?? What a bunch of baloney. I have personally seen one Mountain Lion in Clay County, WV on an old log road within 100 ft of our vehicle and tracked another one along the Meadow River in Nicholas County, WV. What's the big deal? If it stalks like a cougar, kills wildlife, livestock, pets and attacks people like a cougar, what's the problem? We've re-stocked the West with Canadian wolves so why worry about another non-native predator setting up shop where it wasn't originally found. I say ship as many as we can back East as we have more than weed need in the West. . It's not a question of decrying man's existence. It's coming to grips with the fact that there are too many of us inhabiting a small, finite planet. There are limts to available fresh water, to the source of food that can be grown, and we can only harvest so many fish before the oceans empty out. The intelligent person is one who faces the facts and looks for responsible ways to limit our accelerating growth as a species. There are just too many of us. Period. Here's the deal Alex. Things like cougars are masterpieces created by mother nature. Things like you aren't. "I feel no guilt at all, and neither should you. The same God that put cougars on the earth put humans on the earth, and holds humansin higher regard than animals. Humans are the ones that will persist til the end of days." the mite from that tick's head have a wild hair? " Meanwhile, we'll stare into mirrors and imagine a Divine Being "made us" in his image. News: Narcissus ain't what God looks like, honest. How do I know? What, you think the only server's on this network are all from this galaxy? Ideas have a genesis. That starting point is faith. Every man has one of two faiths. Either a faith in his own ability to correctly perceive the world around him (flawed and illogical as he admits himself to be), or a faith in something "higher" than himself (God, Enlightenment, Nirvana, whatever) which aids in interpreting things for him. The "Believers" approach ideas from "God". Whereas the "Brights" approach ideas from "No God". Logic can lead anywhere. But logic does not always lead to truth. Truth is truth. And that's it. Winston Churchill~ "Truth is incontrovertible; panic may resent it, ignorance may deride it, malice may distort it, but there it is." I saw one a couple of years ago down here in South Georgia – it jumped across the entire span of pavement on a two lane road. I driving in to work about 7 am! Stopped and watch it walk about 20 yards down a ditch – and then dissapeared into the woods. I reported it to the DNR. Never heard back, got a letter or any response at all. Guess they want it to be "extiinct"! You should post the results of the DNA test you ran on that animal. Otherwise, you have no idea what kind of cougar it was. Just saying. I know people in the Adirondacks who see these cougars. The article is preposterous. It claims that since "scientists" don't see evidence of cougars around that it must be other cougars people are seeing. So I guess that means other types of cougars don't behave as cougars then?!?! Why/What is the motivation for declaring a species extinct? My assertion is that their are indeed Eastern Cougars in the wild they are simply extremely endangered. Once again, a cougar located in the eastern United States does not equate to an eastern cougar. The only way to know for sure is to run a DNA test. Did any of these people you claim saw one of these creatures do that? If not, your claims of eastern cougars existing are equally as preposterous my friend. Cougars seen (and killed) in Michigan and Wisconsin are western cougars that have migrated east from the Dakotas. It's not yet clear whether their numbers are sufficient to have a breeding population. The only problem with this story is the fact that I, and several of the residents of my town in the Adirondacks have personally seen cougars. To suggest that all the Eastern cougars died and were replaced with another subspecies seems like kind of convoluted logic when it is simpler to assume they just aren't extinct.